Today I come to you from the coastline of Permatang Damar Laut, in Bayan Lepas. Yup, I am on a reconnaissance field trip, to check out the sites of a mammoth land reclamation called the Penang South Reclamation scheme (PSR). 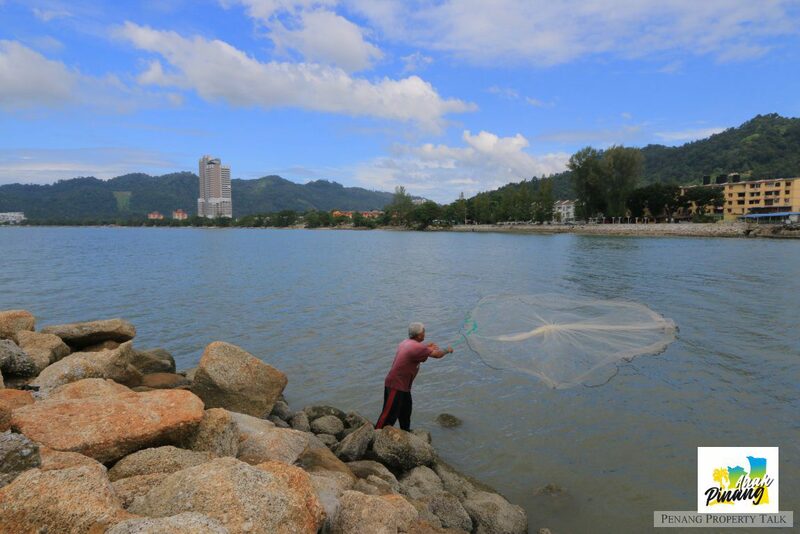 Recently, the Penang State Government announced plans to initiate reclamation on the south side of Penang Island. 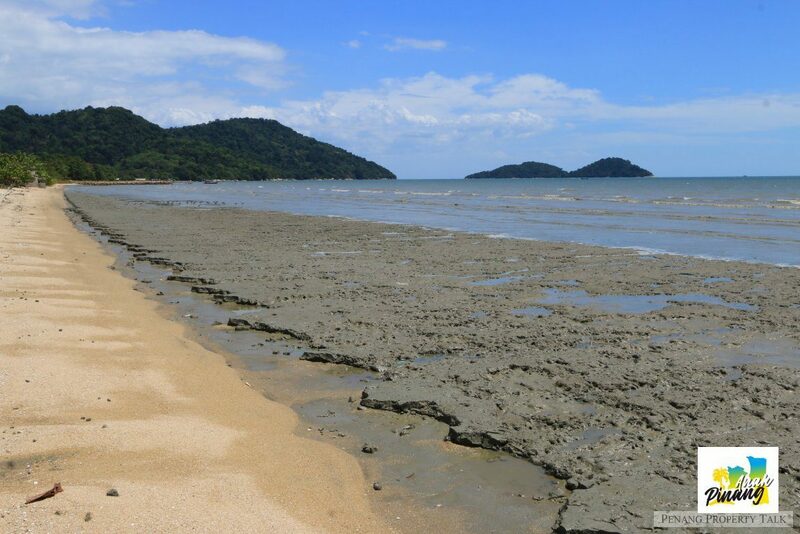 The scheme involves creating three manmade islands off the southern coast spanning Permatang Damar Laut, Teluk Bayu, Sungai Batu, Teluk Kumbar and Gertak Sanggul. As with all mammoth projects, the scheme does not escape opposition. On the other hand, being one who understands the benefits of this scheme, I would like to share with you, so that you too can have a clear understanding of the rationale behind this scheme, which at the surface seems so removed from our everyday Penang life, and yet will have a positive impact on the lives of the people of Penang, not just for a moment, but for decades to come, and that it is to our own disservice to blindly oppose it. And the best way to explain the benefits is with an analogy. Small children can be incredibly self-centered. When we were small, we often make demands of Daddy, whether it is for new clothes, new toys or a new tricycle. We throw tantrums when Daddy said he could not afford. We just want those things. We don’t care how Daddy gets them for us. On one hand, we want Daddy to afford us things, yet on the other hand, we don’t want Daddy to go out to work, because we want him to stay home the whole time and play with us. We would get very upset whenever Daddy used the words “cannot afford”. That’s how we were, as small children. As we grow older, we begin to learn the realities of life. We start to understand why Daddy has to work so hard. We also learn unpleasant things about our own family. Like, how Grandpa had borrowed lots of money, not to help the family, but to waste it on careless spending. Because of Grandpa, the family is in debt. Now it dawns on us kids, those people knocking on our door, they are not friends, they are debt collectors. On 9 May, 2018, the family had a big upheaval, when it was decided that Grandpa is not fit to handle the family’s money, and so a different grandfather – let’s call him Granddaddy – took over the role. But Granddaddy has to settle the debts Grandpa left behind. That means, no new toys, no new clothes and forget a new tricycle. That makes Granddaddy very unpopular, especially with the smaller children. But the bigger kids know that this period of austerity is not forever, and one day, happy days will come again. But until that day arrives, we wished we were innocent children again, so that we could unknow the unpleasantness we now know. Some people, having grown up, continue to harbour that child-like mentality. Except that, Daddy is State Government and Grandpa/Granddaddy is Federal Government. Like children, they make unreasonable demands of the Government. They want the Government to give them this and that, but they are not interested to listen when the Government says it cannot afford to satisfy their demands. For all they care, the Government holds some form of magic wand that materialises money out of thin air. The reality is, the State and Federal Governments operate pretty much the same way every family does. A responsible family is thrifty, and does not borrow unnecessarily. Daddy’s day job is barely enough to cover the family’s basic necessities. To afford the new clothes, new toys or a new tricycle for us, Daddy has to take a second job. 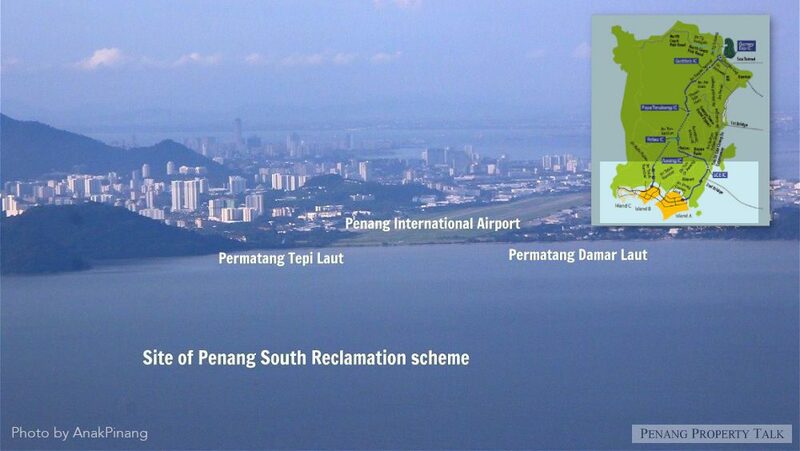 In the family called Penang, the Penang South Reclamation (PSR) scheme is Daddy’s second job. 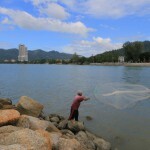 The Penang State Government cannot materialise money from thin air. What it receives only covers the basic necessities of the people. To have more money – to pay for things like a new highway or a new LRT line – it first has to create for itself a new revenue stream. The State Government is aware that the amount of land that can be developed on Penang Island is depleting. That itself creates both a concern and an opportunity. Such opportunities present themselves only to cities that are islands, for they can create new land which will become a much-needed revenue generator for years to come. The plan involves creating up to three islands, which will provide the State Government with as much as 1,800 hectares of land that it will own. This land can then be slowly sold for development as and when the need arises. 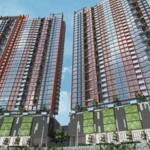 On top of that, 30% of the land will be set aside for public housing, to provide houses for common Penangites. 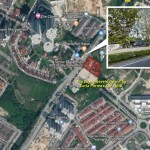 The Penang State Government does not intend to sell off all that land at once. 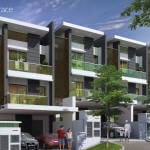 Doing so will have a huge negative impact on land prices in Penang. Some of the lands will be sold, some will be used by the State Government for the people such as creating public space for Penangites. Selling the land gradually serves as a mechanism to ensure property prices in Penang can be controlled and does not steeply increase. To put it bluntly: if we want our future generations to afford Penang property, it is in our own interest to support our government’s initiative in putting this price stability mechanism in place. Such a remark disregards the objective: how does that create a revenue stream for the State Government? Penang Mainland may have a lot of lands, but if it does not belong to the State Government, it doesn’t benefit the government, and therefore, could not be channelled back to benefit the people. Now that we understood how the Penang South Reclamation Scheme will benefit the State Government, it is also necessary to be aware of the environmental and social impact this mammoth scheme will have on Penang and its people, especially those staying along the southern coast. And to best understand this, I visited the places involved. Permatang Damar Laut is an area on the south side of the Penang International Airport. 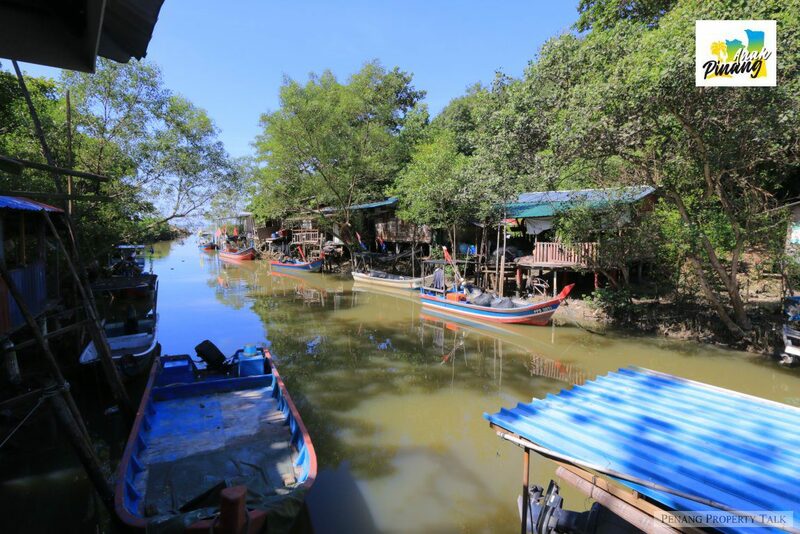 While it is part of Bayan Lepas, it is composed of several kampongs including Permatang Tepi Bendang, Permatang Tepi Laut and of course, Permatang Damar Laut proper. In the 1970s, the Penang International Airport underwent a major expansion. The extension of the airport runway resulted in the relocation of a portion of Permatang Damar Laut by a few hundred meters away. The only trace of that village is its village cemetery, now an “island” surrounded by airport land. 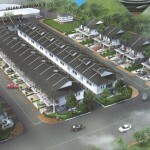 Jalan Permatang Damar Laut cuts right through the airport land. In the subsequent decades, the paddy fields in the area were developed, and the village of Permatang Tepi Bendang became expunged. To the west side of airport land is the village of Permatang Tepi Laut. Today, it is the only intact settlement in Permatang Damar Laut that has neither been relocated or expunged. 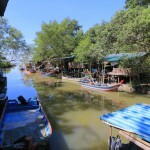 Sungai Permatang Damar Laut flows beside this small fishing village, which has its own little fishermen’s jetty. 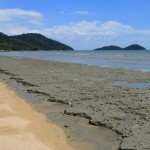 The coast has a muddy bottom, and at times, you can see mudskippers. During the Second World War, the British built small batteries, colloquially known as pillboxes, the relics of which can still be seen on the coast. During my visit to Permatang Tepi Laut, there were a few villagers sitting around a table, at the local fishermen’s hall. I got into a conversation with them. Friendly rural folks, they asked me if I were a reporter. I told them I am exploring the area to know more about it. 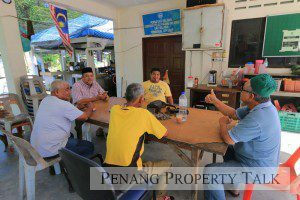 I asked them about the neighbouring village of Permatang Damar Laut, which was relocated in the 1970s. The villagers told me that those people were lucky, because as a result of the compensation, the relocated folks received a proper plot of land with brick houses to replace their wooden village houses. In comparison, they were “not that lucky” because their village, Permatang Tepi Laut, did not have to relocate. I did not inform the villagers that in the future, they too might have to relocate, if their village is in the path of the Bayan Lepas LRT. (Yes, the LRT will pass through here on its way to the first of the three reclaimed islands. The exact path of the LRT line, I do not yet know.) But if that were true, I believe they would welcome the idea, for finally, they could enjoy the compensation received by neighbouring Permatang Damar Laut few decades earlier, conditional of course, to their being the rightful title holders of the land and not squatters. Careful not to plant words in their mouth, I asked if they are aware of the plans to reclaim land off the coast. Yes, they were aware but didn’t seem perturbed by it. In fact, based on the benefit received by neighbouring Permatang Damar Laut decades ago, the people I spoke to at Permatang Tepi Laut seemed to welcome change. As I chat with them, these villagers came across as admirably resilient and pragmatic, and more welcoming of progress than we often give credit to rural people. I realise that quite often, villagers who oppose the government’s plans are those who have words planted into their mouth by outsiders who derail the government’s plans for their own motives. As Penang urbanises, the remaining rural pockets may have to undergo change, something that many villagers have come to accept. Change was already happening in places surrounding Permatang Tepi Laut – in Batu Maung, in Teluk Kumbar, in Bayan Lepas, so it is only a matter of time before it arrives at this sleepy village. In fact, the people of Permatang Tepi Laut deserve the change – especially a change to a better life, with better housing, better standard of living, and a better way of earning a living. Even the way they fish may have to change. But the fear of change is understandable, and should not be ignored. The key is to apply a sympathetic approach to managing that change. AnakPinang understands the necessity of the Penang South Reclamation scheme. The funds it generates can be applied to the improvement of our infrastructure, particularly the Penang Transport Master Plan, which leads to a better life for all of us. In addition to that, enlarging our state land bank will help prevent property prices from drastic overheating. Nevertheless we will remain watchful and will impress on the State Government that the common people impacted by the Penang South Reclamation scheme benefit rather than suffer. After all, what purpose a scheme if it doesn’t benefit the people? Often, people who could not articulate their plight have their well-being overlooked. At AnakPinang, we want to ensure that those impacted will not be adversely affected, while those not directly impacted will be able to see and enjoy the benefits. It is therefore a necessity for us to understand the change the villagers have to undertake, and in our most sympathetic manner, ensure that the transition involved will be handled with the greatest of care. There are times we cannot avoid progress, but neither should we become casualties of it. I agree totally with what was written by Timothy, Penang should really buckle up and move on fast instead of dilly dally like before. Get a lesson from the China administration immediately.